A friend of mine once sent me a Christmas card that showed a can of peas being poured over a globe of the earth. The caption read “Peas on Earth”. This incredibly groan inducing pun was a partial inspiration for this particular image. Also I had obtained an image map that was a satellite view of the earth and so I thought wrapping that image around a sphere would make a nice Christmas ornament. 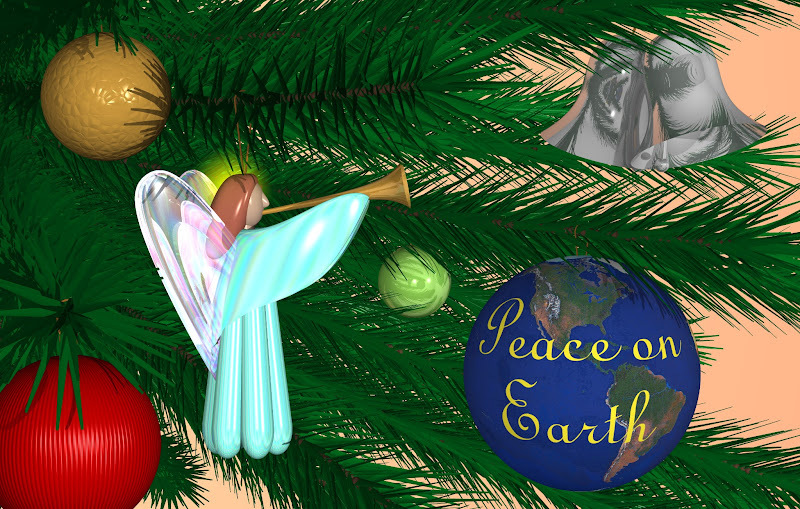 Rather than being “Peas on Earth” or a traditional “Peace on Earth” I put “Peace on Earth” on the Earth. 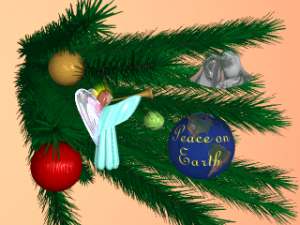 The most difficult part of this image was designing the evergreen branches, positioning them, and positioning the ornaments hanging from them. One of the problems with computer modeled objects is that they have no solid substance to them. Objects can pass through one another even when you don’t want them to. 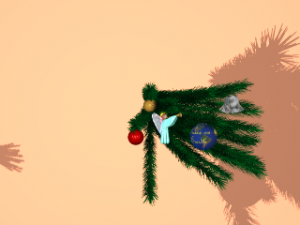 Several early drafts had pine needles protruding into and back out of some of the ornaments. I had to fudge the position slightly. There still may be some needles sticking into the ornaments but it’s not as obvious a mistake unless they suddenly appear poking out the other side. One of the problems is that they have a highly reflective surface and there was nothing beside the camera or to either side of the image to reflect. It was just black void. Therefore the entire model was “encased” in a white box with a tan surface behind the image. 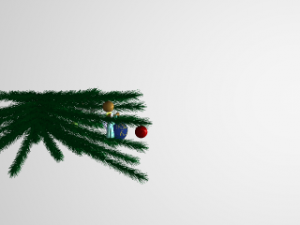 I did not actually model an entire Christmas tree in this image (although I would in future images). In 1996 even this small model was pushing the limits of what my computer can handle. There are actually six rows of branches and eight “columns” of branches. I said columns with quotation marks because they are actually arranged radially around a central axis. The images below show a real model at a wider angle and from different directions. On the backside of the card following explanation of how it was created. This Christmas card was designed and created by Chris Young using POV-Ray 3.0 ray tracing software. No other computer modeling tools were used except a text editor. The model contains over 20,000 objects and consume 15.9 meg of memory while rendering for 7 hours, 28 minutes, 43 seconds on a 100 mhz Pentium. 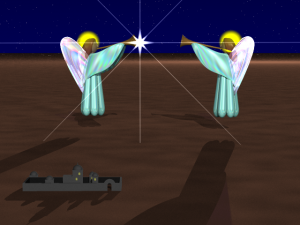 The Angel is a 3-D realization loosely based on a Joanne Austell line drawing which is the logo St. Gabriel Catholic Church, Indianapolis. Note that the email address I gave was an old CompuServe email address and my webpage was with local ISP iQuest.net which was the first Internet provider I ever used. That account and page are no longer active of course. The previous card had a message on the back but it did not say what kind of computer rendered it or how long it took. This one notes that it was a 100 MHz Pentium and I presume that the 1995 card was rendered on the same PC. The original card was printed on plane card stock not glossy. I cut the stock so that the folded card was 4″ x 6″. In those days you couldn’t buy greeting card stock with envelopes. In order to get greeting card size envelopes I went out and purchased the cheapest ugliest Christmas cards I could find. I threw away the cards and used the 4 x 6 envelopes. The image itself had a quarter inch margin all around making it 3.5″ x 5.5″. Assuming I rendered it at 300 dpi, which was typical in those days, it came out 1050 x 1650. 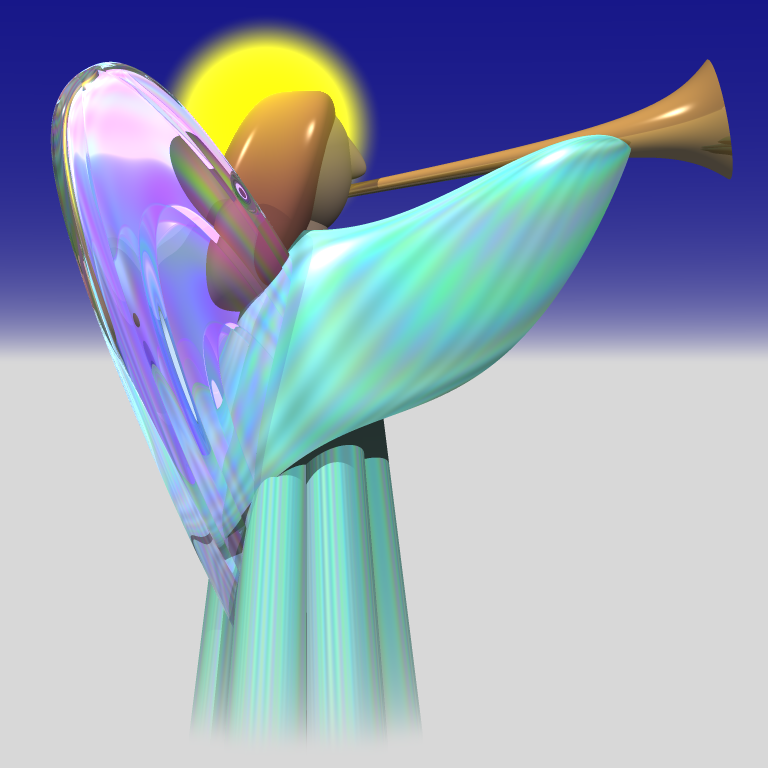 I re-rendered the image using my current Intel i7 quad core under Windows 7 and it ran in just 10 minutes 24 seconds compared to 7 hours 28 minutes on that old computer. On the new machine I cranked it up to 600 dpi which is 2100 x 3300 and it only took 31 minutes: 38 seconds. The speed difference is really amazing. 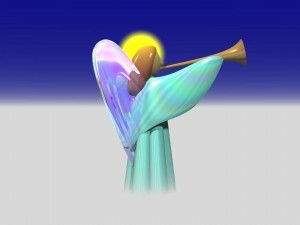 The image that is uploaded here is a modern rendering. There must’ve been some minor changes in the way POV-Ray handles the halo feature because the halo on the angel is much dimmer than it was on the original image. I haven’t bothered to readjust the source file so the halo comes in brighter and more solid. In our next installment we will display what is arguably my most beloved image. 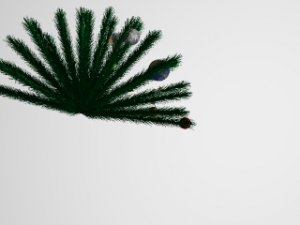 Starting in 1995 I begin making Christmas cards using the Persistence of Vision Ray Tracer (POV-Ray) open-source freeware software which I helped create. Using a script of text commands it generates photorealistic three-dimensional images with realistic lighting, shading, shadows and other image effects. 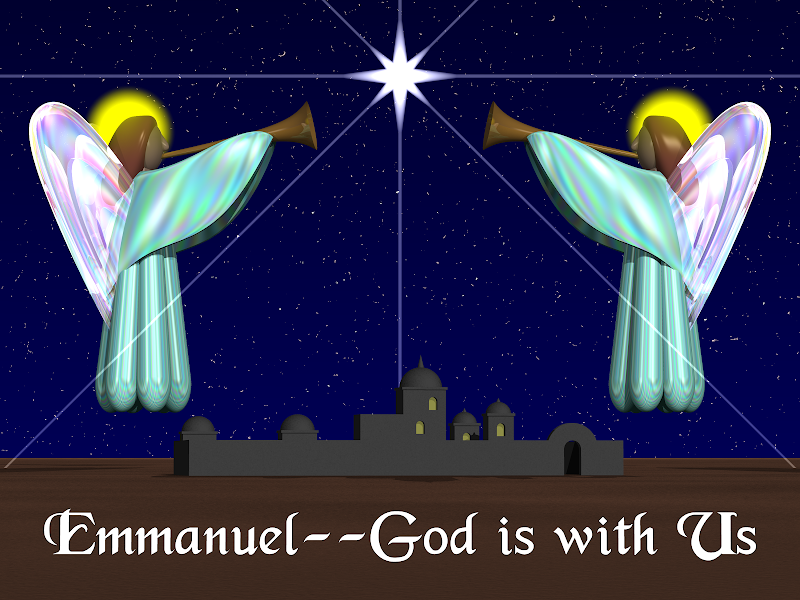 I’m going to use this blog to share some of my creations throughout the years however before I start off with the 1995 card, I thought it was important to share with you my very first “computer-generated” Christmas card. 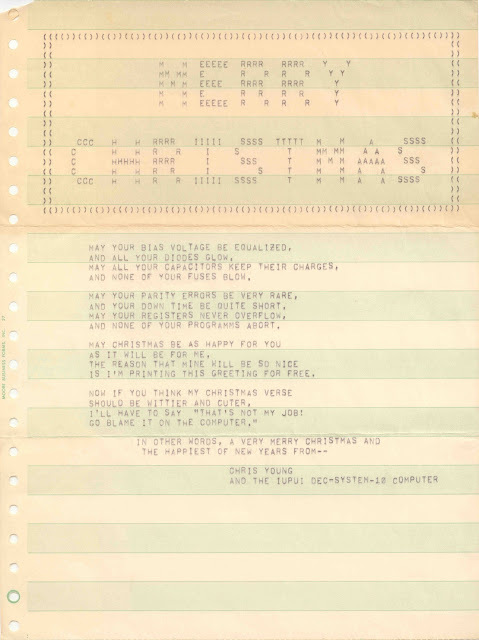 It consisted of some ASCII art spelling out the words “Merry Christmas” followed by a cheesy bit of verse that I composed. The entire thing was printed out on green bar computer pape line printer of the DEC-System-10 computer at IUPUI when I was a computer science student there. An image of the card is shown below but in case you can’t read it, following that is the verse that I wrote (questionably bad punctuation included). AND ALL OF YOUR DIODES GLOW. AND NONE OF YOUR FUSES BLOW. AND YOUR DOWNTIME BE QUITE SHORT. AND NONE OF YOUR PROGRAMS ABORT. AS IT WILL BE FOR ME. IS I'M PRINTING THIS GREETING FOR FREE. I HAVE TO SAY "THAT'S NOT MY JOB! GO BLAME IT ON THE COMPUTER." Here are some of the obscure references behind the text. “Bias voltage” is something that tape recorders use to eliminate background hiss and noise. Rather than having the electricity go plus or minus a couple of volts say from +2v to -2v the recording head adds a bias so that perhaps it goes from +5v to +1v. I don’t know if these values are even in the ballpark of what’s actually used I’m just explaining the principle. In the mid-1970s cassette tapes came in different varieties. The ordinary tapes used “normal bias” and the newfangled metal oxide tapes use something called “high bias”. When you play back the tape, in order to get the best results your playback had to equalize the bias voltage properly. There was little switch you had to throw between high bias and normal bias. I still don’t understand completely what it means but it sounded cool so I included it. “Diodes glow” in the mid-70s light emitting diodes were relatively new technology. Capacitors and fuses are pretty straightforward. No explanation needed. “Parity errors” when computers transmit data over a serial line they generally transmit eight bits at a time but in order to detect mistakes they transfer a ninth bit called a “parity bit”. 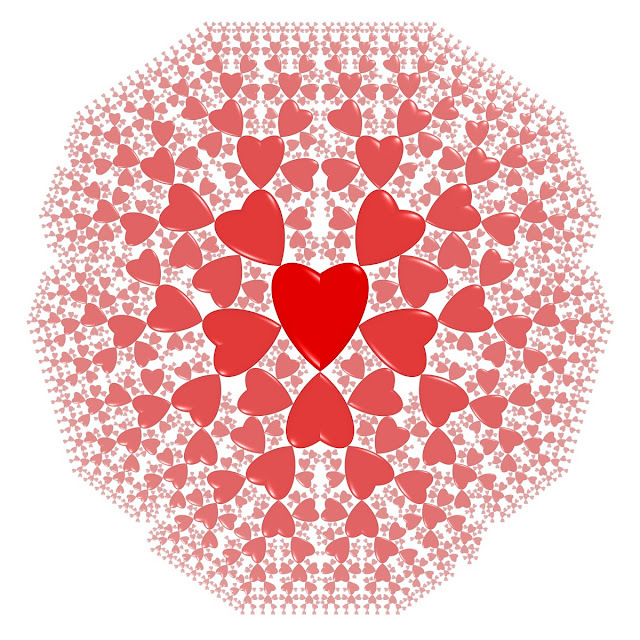 Parity can be “odd” or “even”. That means in the string of 1s and 0s you add up the number of 1s and see whether you get an odd or even number. If you’re expecting odd and you get even that’s called a parity error. That’s bad news. You want them to be “very rare”. “Register overflow” computers do arithmetic in special storage places called “registers”. But registers can only store a number with so many digits (or bits). If you try to do arithmetic with two big of a number you get a register overflow error. That’s bad. “Free printing” if I had typed up the text and taken it to the library and xeroxed it it would have cost me 10 cents per page. But if I typed it into the computer and told them to print me 30 copies of it, it was free. I had a psychology professor who had discovered this and rather than type up his class notes or handouts and xerox them, he would just put them on the computer. They would print as many copies as he needed to distribute to his students for free. It seemed strange to get class notes from a liberal arts teacher on green bar computer paper but it was pretty smart of him. It inspired me to print these cards that way. “That’s not my job!” There was a popular TV show called “Chico and the Man” starring the late Freddie Prinze Sr. He was a bright and rising young Chicano standup comic who at the age of about 19 got his own sitcom. He played Chico who worked in an auto repair shop run by cranky old man played by the late great Jack Albertson. Although he talked in plain English most of the time, whenever “the man” would tell “Chico” to do something he didn’t want to do he would throw on a very thick Hispanic accent and say “ezz no my chob mhan”. (It’s not my job). That phrase got to be a pop-culture catchphrase. Tragically Freddie Prinze committed suicide at age 22. He was the father of TV and film star Freddie Prinze Jr.
“Blame it on the computer” is to this day a pop-culture catchphrase.